Did you know that the lightest regular garage door out there is about 80 pounds? While a professional weight lifter can sneeze while manhandling 80 pounds at least twice a day to get in and out of the garage, us mere mortals need a little help. That’s why long ago some genius invented garage door springs and their assemblies. Without those crucial springs, you’d be stuck with a garage you couldn’t open, which would be rather useless. Like all things mechanical, sooner or later our garage door springs will break. The question is, when? How long do they last? Garage door springs are rated for a certain number of cycles, not years, although years can be extrapolated to some degree. A cycle is an opening paired with a closing. Opening the door is half the cycle, closing it is the other half. The lightest springs are rated for 10,000 cycles, but you can (and maybe should) replace a broken spring with one rated for 25,000 cycles. If you only use your garage door twice a day, on average, you can expect a 10,000-cycle spring to last upwards of 13 or 14 years. 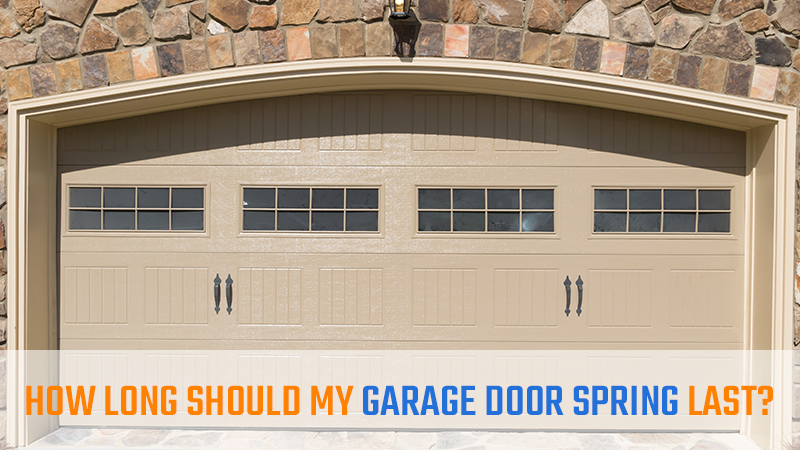 But if you and your family tend to use your garage as your primary entrance, you might need to replace the spring around the 5-year mark. Your spring — or springs if you have the extension springs as opposed to the torsion spring — can suffer from extreme cold and rust. Humid climates can generate rust on the metal and, eventually, the rust will prevent the easy movement of the spring and place stress on the automatic opener. Besides a shorter life span on the spring, your motor will burn out faster, too. A shot of silicone spray every three months should prevent rusting. You may have heard already that replacing the torsion or extension springs can be dangerous work. Please take that truth to heart. 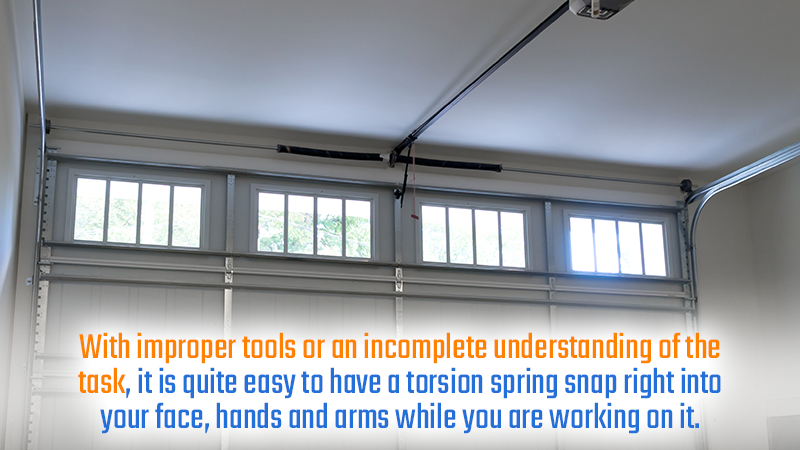 With improper tools or an incomplete understanding of the task, it is quite easy to have a torsion spring snap right into your face, hands and arms while you are working on it. If you think you’re having a bad day when the IRS shows up at your house, just try stopping a torsion spring with your face while standing on a ladder. Rather, if you’ve never replaced the springs before, we highly recommend you call in the professionals. The cost of a service call and labor are a very small price to pay for your safety. A pro will know exactly how to adjust the tension on the new spring, too, and can accomplish the entire job in less time than it will take you to watch tutorial videos on the subject. Plus, if the result is a little off, he or she will return to make it right. At ACS Overhead Doors, we take pride in offering fast, friendly service when you think your springs may be old and ready to break. Contact us for a free consultation or to schedule an appointment today.